MSI shows off its new Z68MA-G43 (G3) motherboard with PCIe 3.0 support. Leading global graphics card and motherboard brand and manufacturer MSI officially announced the Z68MA-G43 (G3) motherboard today. The new motherboard will be the first in the industry to adopt the next-generation PCI Express Gen 3 high-speed data transfer standard to deliver unprecedented levels of performance with a staggering 32GB/s of bandwidth. The motherboard will also feature MSI's proprietary ClickBIOS II that will allow enthusiasts to use the mouse or even touch control panel to adjust the system and overclocking settings through UEFI BIOS or Windows applications. In addition, OC Genie II is included and can be used to optimize the CPU, memory, integrated graphics card, and storage devices for maximum stability and performance in just one second. When combined with Intel Smart Response Technology the performance of conventional HDDs can be increased by as much as 457%. With support for all solid capacitors, USB 3.0, SATA 6G, HDMI / DVI / D-Sub video-out, and multiple CrossFireX graphics cards, the new motherboard meets enthusiasts' demands for system stability, expandability, and extreme game graphics. In June, 2011, MSI put the Z68A-GD80 (G3) on display at ComputeX. The new motherboard was the first in the world to feature PCI Express Gen 3 technology and its industry-leading specifications delivered a staggering 32GB/s of bandwidth; double that of the current standard at the time. 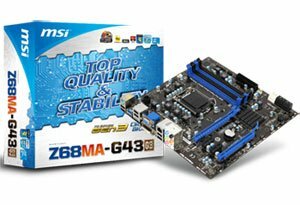 MSI first brought the next-generation high-speed data transfer standard to the general public at ComputeX, and now, to satisfy DIY enthusiasts’ demands, MSI has introduced the new PCI Express Gen 3 standard on all motherboards from the entry-level Z68MA-G43 (G3) to the high-end Z68A-GD80 (G3). ClickBIOS II is the first system utility in the world to integrate UEFI BIOS and Windows applications. System settings can now be adjusted using the mouse or even touch control panel in different environments; MSI’s competitors' products only support UEFI BIOS or Windows applications. ClickBIOS II offers a more user-friendly interface that combines convenience with sophisticated technology. MSI's exclusive OC Genie II can provide amazing performance boosts quickly by optimizing the performance of the CPU, memory, integrated graphics card, and even storage devices, all at once. Enthusiasts can now achieve maximum performance and stability without having to spend time tweaking system settings. Actual results from industry-standard benchmarking software 3DMark Vantage and PCMark Vantage indicated that MSI’s OC Genie II boosted 3D gaming performance by 145%, and when combined with Intel Smart Response technology, HDD access performance increased by up to 457%.